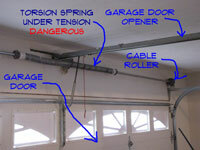 Most homeowners should not attempt to adjust or replace 'Garage Door Torsion Springs'. The problem is that they have to be worked on when the door is down and the springs are under tension. When you release the set screw you have to have a rod in place and be holding it to control the force of the spring. Replacing garage door springs of this type is not recommended for the average homeowner. There are those die hard do it yourself pros that insist on doing everything themselves. Are you one of those? Well then you should check further online for instructions on replacing garage door springs. Look for torsion springs. Clopay a manufacturer of residential garage doors has some instructions that may apply to your situation , Follow this link to check it out. There is another article that gives you and in depth discussion of this type of spring. The article provides installation instructions for springs and adjustment information, follow this link, to review the article. I have been in construction most of my life and I personally know a few garage door installers. I have worked on garage door torsion springs and I must confess that it made me nervous. I will not relate some of the horror stories, however, I will say that people have been seriously hurt, messing around with this type of spring. Before you call a garage door serviceman, write down exactly what the door is doing. Verify by examining them that the springs are broken. Springs either work or the don't, there is not much in between. Write down the width and height of your door and the type of door you have. Ask for a quote over the phone for a cost on replacing both springs. Make sure you specify both. Sometimes they will try to quote you for one spring and want to charge you double when they show up. Replacing garage door springs gets expensive when your taken advantage of. Call at least three places and try to make sure they are actually different places. Get quotes from all three. If they won't quote it over the phone, call someone else. A door that works, but does not close all the way does not need to be replaced. Make up your mind that you are not buying a new door. You have established that one of the springs is broken. You need to replace them both. You should be able to get them replaced for $150 to $200 unless you have an unusually large door. Torsion springs have cycle ratings. The minimum is 10,000 with the highest being 100,000. Ask about the cycles and get the longer lasting ones if you can. You will need to weigh the cost of better quality springs and decide if you want to spend the extra money. It should not be a lot more. The labor is the same so it is just the cost of the springs. You don't want to be replacing garage door springs any time soon.